The custom 68” arc khaki / forest green umbrellas with classic umbrella designs and vented windproof canopy construction. Such umbrellas are perfect gifts if you are sponsoring an event like that of a live concert or a sports event. These come with a fiberglass frame and a metal shaft. The foresaid features add to the durability of the personalized 68” arc khaki / forest green umbrellas with classic umbrella designs. The blonde wood grip handle is another feature of the umbrella that helps your customers holds it tight. They are light weight and less conductive to lightening. 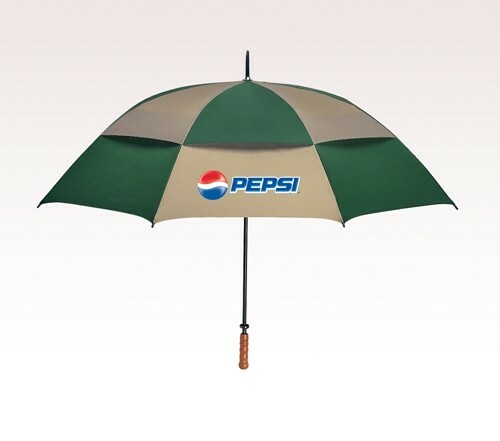 The promotional 68” arc khaki / forest green umbrellas with classic umbrella designs are wind resistant up to 55MPH. The canopy is made of nylon material and offer enough brand imprinting space. 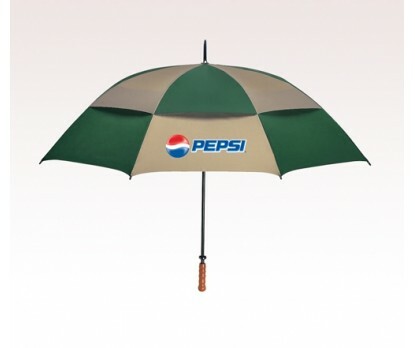 These branded umbrellas definitely boost your brand name out in the crowd. Product & Design Quality - Excellent!!! Customer Service & Shipping - My expectations were exceeded....thank you!! Product & Design Quality - We ordered Umbrellas with our Church logo. They are a high quality that has stood up to Florida weather. Customer Service & Shipping - Customer service was excellent! They were very helpful in helping me get exactly what would work best for us! Shipping was done quickly!